Since 2005, iLounge's editors have selected each year's best upcoming Apple accessories from an ever-increasing pool of products debuted in January. Our Best of Show Awards remain the Apple accessory industry's most difficult to earn, as they are based exclusively on merit, extremely limited in number, and cannot be bought in any way. Unlike other publications, iLounge has never charged for either award submissions or usage rights. Best of Show Awards always focus on the rare combination of great design, features, and pricing; Best of Show Finalists demonstrate excellence in two of those categories but fall a little short in the third. 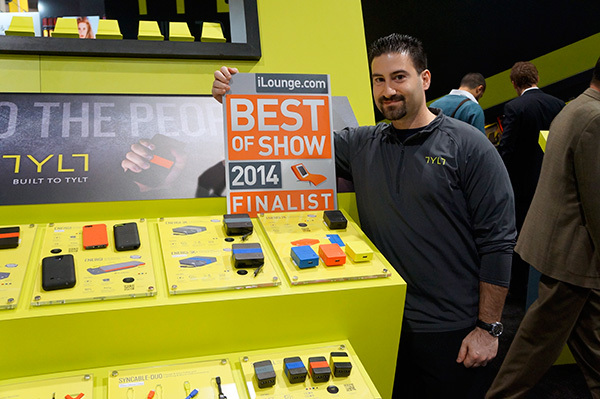 We are both confident and proud of the Awards we are presenting today at the 2014 Consumer Electronics Show. Despite our pre-show concerns as to the innovation and quality we might see across hundreds of Apple-focused exhibitors, this year's collection of accessories include some really exciting and polished new options. Following an extended advance submission process, our team of editors followed up by actively seeking out excellence on CES's official show floors, selecting only the best products for Best of Show and Best of Show Finalist Awards. Congratulations to all of the winners and finalists-we also thank the many companies that participated in the process. Best of Show Finalist: Tylt Energi 2K + 3K Travel Chargers. Sold for $30 and $60 respectively, these 2000mAh and 3000mAh battery packs have fold-in wall prongs so that they're easy to recharge anywhere. Priced right for their features and nicely designed, the 2K version has a USB port, so you supply your own cable, while the 3K version has a Lightning cable built in.